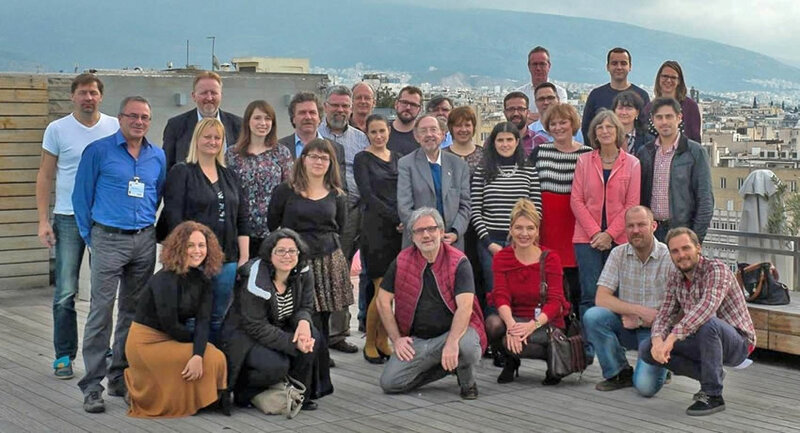 From Dec. 3rd to Dec. 5th the Interim Conference of “Click for Support” took place in Athens, Greece. After the first phase of the project, the project team now had the chance to discuss the results with the entire group. Every partner got the chance to report from their national experiences with the target group and the current situation regarding web-based interventions in their countries. Additional to the national reports three experts on web-based interventions provided their expertise from different perspectives on the topic. Dr. Peter Tossmann (Germany) presented success and failure factors and general possibilities for web-based selective drug prevention, Matthijs Blankers (the Netherlands) focused on the research and evidence perspective of web-based intervention whereas Herwig Claeys (Belgium) approached the topic from a more technical angle. After two very productive days of work in Athens, the project coordination is now very well prepared to take up the challenge of developing applicable and valuable guidelines. After the first day of the conference, everybody was now on the same page regarding the results and experiences of the first project phase. Based on those results and experiences and the input from the experts, on the second conference day the group defined important aspects for the guidelines and controversial issues that should be discussed in the upcoming Delphi study among European prevention experts. Also issues of dissemination, e.g. the LinkedIn group were discussed. Finally, worth mentioning is the fact that the project has even raised interest in Brazil which was shown by the attendance of a colleague from the Brazilian Ministry of Justice who had learned about the project through the EMCDDA.